Narrow Hallways – Installing Shelves | Fix It! When you are living in a smaller unit every inch of space is important. 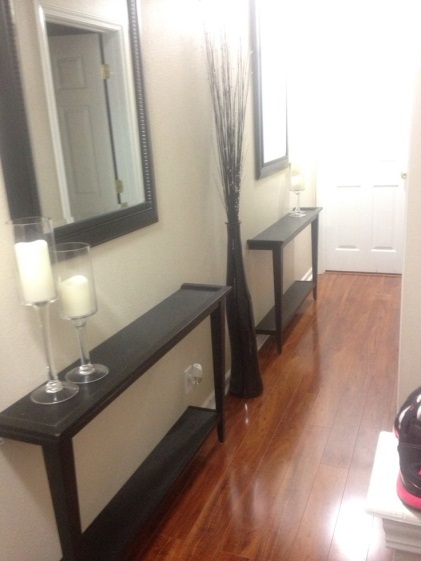 In some of the condo units that FIXIT has worked on, we have seen long narrow hallways. This space isn’t generally a functional part of the unit but some people have made it functional by hanging up shelving or adding narrow tables. Big, bold artwork or trendy wallpaper can also add a great wow factor. Here is a site that I found to be an inspiration for many of my clients. It has a lot of good visual ideas. TIP: Go vertical. Hang shelves for storage space and a splash of colour.